The name Bjorge Lillelien might not be too familiar, but it was what he said on September 9, 1981, on Norwegian radio that sealed his place in broadcasting history. “Lord Nelson!” There was a pause… as if for thought. “Lord Beaverbrook!” Not an obvious English hero to recall, but Lillelien was just about to get into his commentary stride. And then Lillelien really hit his straps. “Maggie Thatcher! Can you hear me? Tor Aune, the recently retired head of NRK Sport, remembers his former colleague well, and was unsuprised by the break from Norwegian language commentary into an address to England. “Lillelien was totally comfortable in English. It was not a surprise when he did this,’’ Aune said. England had not been successful in qualifying for the World Cup finals since 1962. Under Ron Greenwood, their campaign to reach the 1982 tournament in Spain had had its ups and downs. In the previous match, they had beaten group leaders, Hungary, 3-1. Thirty years ago, Norway’s football reputation was only marginally better than their Eurovision performance of “Nul points”. 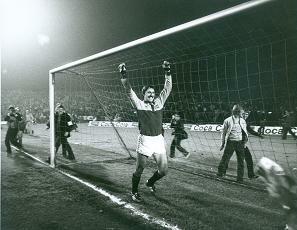 And in Oslo’s Ullevaal Stadion, Bryan Robson had even given England the lead. But the Norwegians, roared on by a partisan crowd, scored twice before half time and held on to their advantage, to the horror of early evening viewers on ITV, who had the live coverage of the match to themselves in those pre-Sky days, presented from a studio in London by Jim Rosenthal. Despite the defeat, England did qualify for the 1982 World Cup after other results in the group went their way. Even in the days before You Tube, this commentary clip was an instant hit. In 2002, it was acclaimed as the greatest commentary moment by Observer Sports Monthly (is that a decision with which you agree? Why don’t you post a comment below on your favourite piece of sporting commentary?). Lillelien’s fame spread throughout Scandinavia. Iceland’s Ingolfur Hannesson, now a senior executive at the European Broadcasting Union, remembers hearing the broadcast while a student in Oslo . Lillelien also presented a jazz programme as well as covering winter sports and boxing. His greatest wish was to see a Norwegian heavyweight champion of the world. He died in 1987, aged 60. 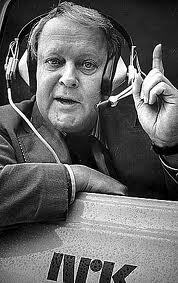 But no one in Norway will ever forget the night that England were beaten, not least because of his memorable commentary. Click here for the YouTube clip of the commentary. ENGLAND’S LINE UP IN OSLO: Ray Clemence; Phil Neal, Mick Mills, Phil Thompson, Russell Osman; Bryan Robson, Glenn Hoddle (Peter Barnes), Terry McDermott; Kevin Keegan, Trevor Francis, Paul Mariner (Peter Withe). What’s your favourite, or choice of best, piece of sporting commentary? Post your comments below. Wed Dec 7: SJA 2011 British Sports Awards – Book a table before oct and SAVE £200. For more details, click here.